For such a little book Handmade Houses & Other Buildings by John May (published by Thames & Hudson) really does explore the world of vernacular architecture in an informative and amazingly detailed manner. It starts out with a full color "Gallery of Building Media" that showcases houses made with the primary materials found around the world: wood, stone, earth, bamboo, reeds, snow, skins and animal fiber, and recycled materials. The author points out that "vernacular architecture, by its very nature, is built from local materials that are readily to hand and is thus defined by the geology and ecology of the region and by local climate conditions. Constructed by the community using traditional tools, these structures are highly practical, energy-efficient, and blend with the landscape. These buildings carry many of the attributes that we are now seeking in 'green architecture' as we struggle to adapt our built environment to the demands and concerns of the climate-change era." I might add that these building also tend to do all of this in an elegant and lovely manner. The remainder of the book is divided into the major regions of the globe where one can find such architecture and showcases many fine examples of what you might expect from each. A two-page layout is devoted to every example, with both descriptive and cultural data provided. The illustrations alone are worth the price of the book, with considerable detail lavished on exactly how the buildings are assembled and with what materials. One could literally attempt to duplicate many of the structures just from what is shown. What a pleasure to delve into the of forms and functions that have sprung from the fertile mind of man! I have to say that for shear inventiveness, the world of vernacular architecture puts many modern, professionally designed buildings, to shame. Of course this is the realm from which modern architecture has evolved, and it is worth paying homage to these archaic forms and solutions for housing. They are the very roots of all architecture. Which brings us to the modern era, where the most prominent vernacular building happens to be found in the shanty towns of urban environments. In these circumstances, the recycled cast-away materials of society provide most of the building blocks available to the inhabitants. Squatter settlements can be found around the world, often barely tolerated by the local authorities. The folks who live there actually may prefer the kind of life they have carved out for themselves, where they live and work at the same place, operating within a kind of underground economy. Modern day "Earthships" stem from this tradition, where used tires and other recycled items are prominent resources. And of course the whole notion of "natural building" is really an extension of vernacular architecture, and has value for many of the same reasons of living with a low carbon footprint. Many approaches to building naturally are really revivals of old ways of building. 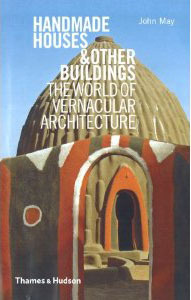 This book is a great reminder of the value and inspiration that can be found in vernacular architecture. I highly recommend it.